This fun DVD program helps native Spanish speakers build success in learning English. Learners hear words and phrases spoken in Spanish followed by English. They gain confidence by progressing from very easy to more complex. Catchy songs and colorful action keep learners focused and allow independent practice. 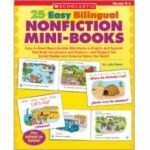 Covers greetings, survival phrases, school conversations, subject pronouns, and much more. Approx. 54 minutes. Ages 6 & up.�Estas pegajosas canciones te har�n hablar ingl�s en un instante! 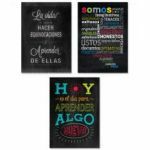 Aprender�s con facilidad palabras y frases completas para poder llevar a cabo una conversaci�n. Nuestros divertidos y din�micos presentadores entretienen y motivan a los estudiantes de todas las edades. Las respuestas se entregan a un ritmo que te permite verificar f�cilmente tu propio progreso. �An�mate a aprender! 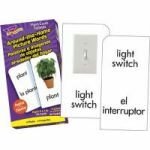 Ahora s�, Let�s Rock �N Learn! 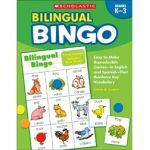 Help students build fluency and gain confidence as English speakers with this bilingual twist to the classic game. 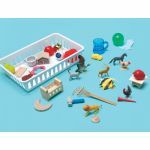 Includes 120 reproducible boards for 15 different themes including: school, home, calendar, animals, transportation, weather and more. 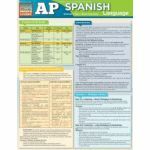 Practice beginning Spanish vocabulary and build awareness of Hispanic culture by learning common Spanish words. Reproducible game cards show vocabulary and English translations. 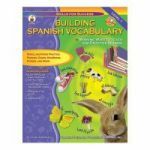 Game ideas and instructions, over 350 Spanish vocabulary cards, a pronunciation guide, and an answer key are included. Celebrate holidays, plan upcoming events or talk about the weather. Names of the days and months are in English and Spanish. 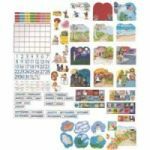 155 piece set includes 11 1/2" x 14 1/2" grid, 31 numbers, 12-6' x7" monthly scenes, 39 monthly special events and 6 weather scenes. Un-cut. Includes teacher's guide.